Students of UIT won the first prize "Student with Information Security 2017"
After 8 hours of intense competition, the final round of the "Students with Information Security 2017" contest was held on 18 November 2017 in Da Nang. The competition is closed with the first result championship belonged to team UIT-r3s0L to from UIT - Vietnam National University, HCMC. 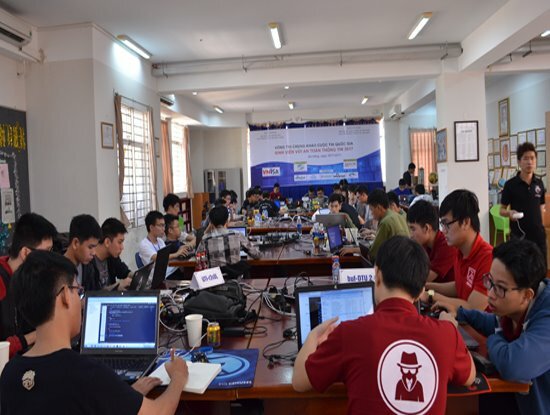 The final round of the competition "Students with Information Security 2017" was the competition of the 10 best teams in the preliminary round on November 4 in Hanoi, Danang and Ho Chi Minh City. Today, November 18, 2017, the final round of the competition "Students with Information Security (ATTT) 2017" was jointly organized by Vietnam Information Security Association (VNISA) in collaboration with IT Department - Ministry of Education and Training office in Da Nang. 2017 is the tenth year of the "Students with ATTT" competition held in Vietnam and is the fourth year to be recognized as a national competition. The final round of the contest was attended by the top 10 teams in the preliminary round in the North - Central - South on November 4, including: University of Technology, Vietnam National University, Hanoi; UIT-r3s0L – University of Information technology, Hanoi University of Science and Technology, Vietnam National University, HCMC; BIGGEAR_BK - Hanoi University of Technology; Emgai's rain - People's Security Academy; Bl4ckH0l3 – Academy of Cryptography Techniques; zono @ UIT - HCMC University of Information Technology; J0k3r - Military Academy of Technology; PTIT Bobo –Posts and Telecommunications Institute of Technology; ISIT-DTU 1 and Buf-DTU 2 coming from Duy Tan University. In the final round of “Student Contest with Information Security” this year, as in previous years, the 10 teams competed as Attack and Defense, in 8 hours. Organizers say the tests will be modeled as a space war. In particular, the server of the system will act as the mother ship, which provides services with bugs (daemons), jeopardy challenges, and weapons. Each team plays the role of a warship to store information, including challenges, scores, speed-ups and effects currently available on that team, and observer warships of the other teams. The teams contact the mother ship to receive information about the challenges and send the results. Challenges revolve around the contents: forensics, Pwnable, Reverse, Web exploit... When the team successfully overcome the challenge, they will acquire weapons, so that the weapons can be used to attack other teams, slow down the score increase of the other teams. According to the organizers, when a team over a challenge (belong to a Jeopardy Prob), the team will have a equivalent weapon, which can be used to attack another team. The offended team will be deducted score in the next round. The score of each round will be counted every 10 minutes and the total duration of the contest is 8 hours corresponding to 48 rounds of points. Scores of teams in the "Students with Information Security 2017" final round in 8 hours, with a total of 48 rounds. The final result, after 8 hours of intense competition, with the achievement of above 8214 points, left the other teams behind, UIT-r3s0L team brought to UIT , VNU HCMC the first prize of the competition "Student with ATTT 2017" won the value of VND15 million. With a score of 3581.16 points and 3443.93 points in 48 rounds, PTIT Bobo of the Posts and Telecommunications Institute of Technology and N / A from the University of Technology, Vietnam National University, Ha Noi won the second prize, with the value 10 million / prize. Three prizes worth 5 million vnd each belonged to three teams Bl4ckH0l3 - Academy of Cryptography Techniques; Emgai's rain - People's Security Academy; and zono @ UIT - University of Information Technology - Vietnam National University, HCMC. Teams BIGGEAR_BK – HaNoi University of Technology; J0k3r - Military Academy of Technology; ISIT-DTU1 and Buff-DTU2 - Duy Tan University won the forth prize, worth 3 million VND / prize. The organizers also said that in addition to the cash prize, the three teams who won the first and second prizes "Students with Information Security 2017", including UIT-r3s0L, PTIT Bobo and N / A and won the right to compete in the BlackHat Asia held in Singapore in 2018. According to the plan, the ceremony of summing up and awarding the MOET Certificate of Merit to the best teams in the contest with this year's Information Security will be held at the International Conference "Vietnam Day of Information Technology 2017" in December 2017 in Hanoi.